It’s not a secret that the best meals are usually made with just a few ingredients, allowing the unadulterated taste of each food to shine through. It’s not a secret that slow cooked, time-tested recipes are always winners. 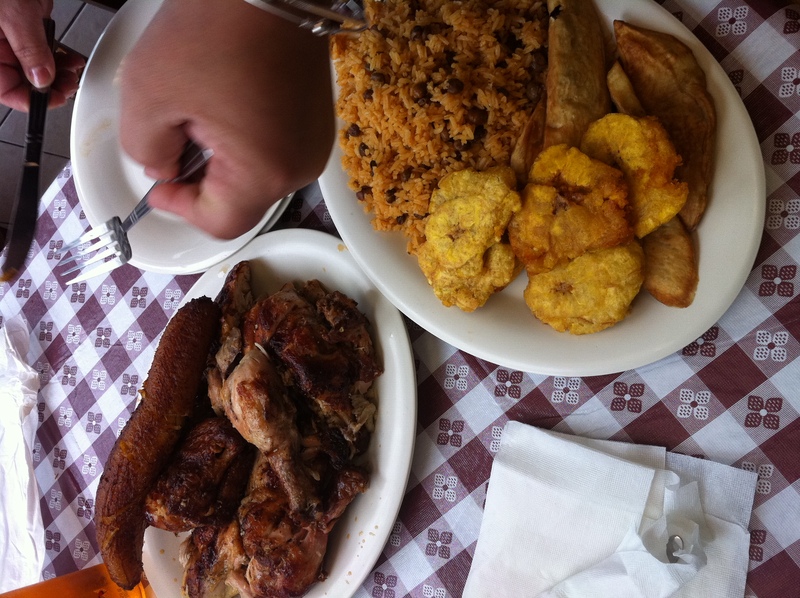 And it’s not a secret that when you walk into Alex’s Chimis on Centre Street in Jamaica Plain, you’re going to eat some of the best chicken you’ve ever had. A friend of mine, born and bred in JP, recently took me to Alex’s. She explained that when the small, spare restaurant first opened, they were hoping to become well-known for their namesake – “Chimis” – Dominican-style hamburgers that feature prominently on the menu. But it turned out that their simple roast chicken was what kept the crowds coming back. For our lunch, we had one whole chicken and one big delicious mess of sides. The chicken was plucked from a row of birds waiting in a metal cage, and sectioned as we waited. 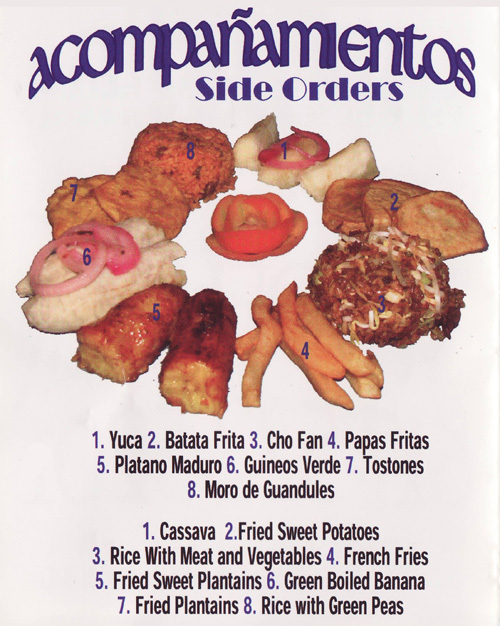 My friend ordered the accompaniments: batata, yucca, platano maduro, and tostones (see menu chart below). They were all delicious, but my favorites were the yucca and the batata- both fried perfectly, and not greasy. I’ve never been much of a rice person – I’m Italian, we eat so much bread and pasta there’s rarely room for other starches. But the rice at Alex’s Chimis had a well-blended, nutty taste mixed with mild spice notes. It was fluffy but not sticky, fragrant, and dotted with pigeon peas. And then of course, there was the chicken. I’m far from the first person to comment on its long list of stunning attributes, but I think The Improper Bostonian said it best: “The skin is vigorously treated with garlic and spices and cooked to a crackle, while the flesh is as soft and moist as if it had been stewed in butter.” I couldn’t have said it better myself. Check out Alex’s Chimis for the sides, the Chimis, and the rice. But don’t leave without trying the chicken.